Only add the fresh fruit in when you are ready to serve. Small whole stawberry is always attractive, and the cut-up mango (the big stalky type) isn't over juicy makes a good choice too. I am really very surprised so many kids crazy for meringue!!! I have seen them gobble it up like there's no tomorrow. My friend's kid always begs me to make a coconut meringue "tower" that I brought over three years ago... How can she still remember?! I thought kid's memory is only as good as Dory's (the blue fish in Nemo Disney movie... who only remembers things that happened half a second ago). I promise her I will make it for a next big fiesta (party), for now we would have these baskets as they're easy, pretty and healthy (with moderation). 1. When I was very young (aged 6 to 10-ish), I hardly had any close friends, caused I spent all my free time working for my mom. No time for tv, radio, books or magazine. When friends chatted about those stuff I had no idea. 2. Had I ever felt deprived? Honestly no. Especially when I saw my neighbor (kid), one of her arms had been badly burned (she worked for her dad too), I felted I was very lucky. 5. Could I take school seriously as what my mom wanted? sorry nope. But my social life was getting more normal though... btw pop culture wasn't a hard subject. 6. I am still not the type of person that can make many friends, but those few I have are very, very decent and good! 7. In middle school in the subject Home Economics, was I a shining star? Fat chance :P I made my apron looked like I had murdered it (pulled the threads way too hard); my teacher tasted my curry beef had to look for a fire extinguisher; and I turned the classroom to a Wonderful when I sieved the flour. But one thing though, any job that required shaping (like bread, pastry or tart) I was very good at. 8. At age 12 or 13, I made a big tray of sweet dumplings to sell. Sadly I couldn't get any customer as I was too shy to speak, but mom still felt so proud as she thought I had her business gene. Obviously she is wrong. 9. Ironically, I did a good job in helping my bro's business (direct selling) and in my other jobs after I graduated (client's servicing). I realize that as long as I am not the boss, I am relax and happy. 10. Can I stop at 9? Anyone want to do this meme? Please let me know! For the recipe of meringue, please refer to this Waitrose's site. But I like to set the temperature lightly lower and baked the meringue up to 1 1/2 hours so that the inside is totally dry and light, which is what I prefer. To make the basket: Drop some meringue with the help of a spoon, then flatten it a little bit with the help of the back of the spoon. Then pipe out the sides. To make the mushroom: For the top, use a bigger hole to pipe out a blob, wet your finger and press down the pointy top. For the stem, use a medium hole to pipe out a vertical leg. Once they are baked and cool completely, cut off (if any) the pointy part of the stems, put some melted chocolate on, place the mushroom cap on. Dust coco powder on the top. The meringue stores well for a few days in an air-tight container in a cool room. 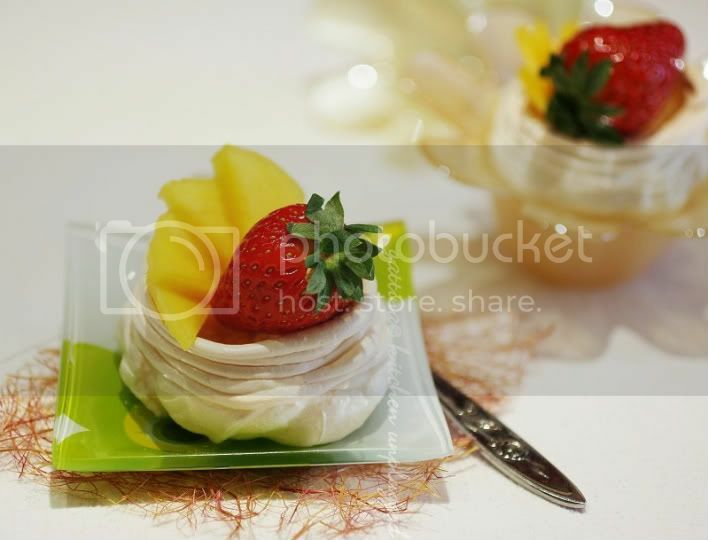 I still like meringue, especially with whipped cream and tropical fruits! Nice to know more about you Gattina, those skills that you learned at an early age are refined to perfection now. 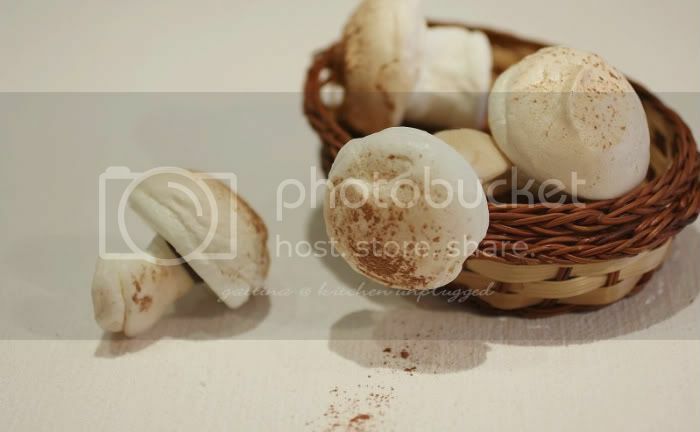 The meringue - the mushroom one especially are first class. Gorgeous! I love meringues... definitely don't see them around here enough. Meringues, fresh fruits and whipped cream = heaven! I love your mushrooms! Looks like two great desserts. Very nice post and blog. Hahahahahaha,...it was fun reading more about you! Yeah! What georgous & delightful desserts!